This festival season, the city of lakes does not offer a pleasant sight as waste management takes a back seat. 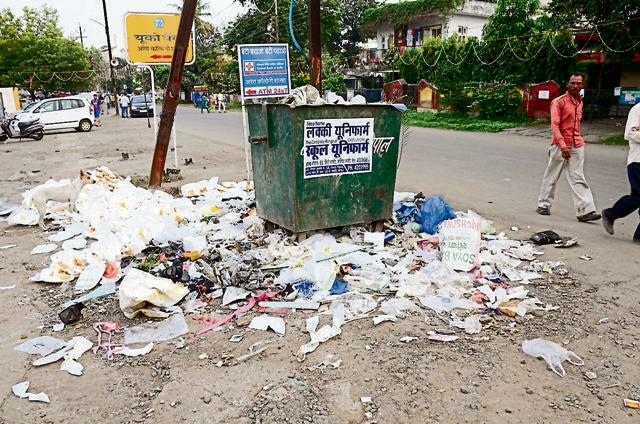 Bhopal generates an average of 800 metric tonnes of waste every day, but most of it lies in the local dustbins these days as many municipal workers have gone on leave to celebrate the festivals. The little that is taken goes to collection centres and from there to the Bhanpur landfill, which has been operating for the last four decades without necessary clearances from the state pollution control board. State urban development minister Maya Singh’s direction few days back to ensure proper waste management during festivities has fallen on deaf ears. Litter from puja pandals and tableaux lie in heaps at Jawahar Chowk, Peepal Chowk, Kayasthpura, Hanumaganj, parts of South TT Nagar, Itwara , Gujarpura and Royal Markets. Residents fear these heaps would rise after ‘Durga Visarjan’ and ‘Ravan Dahan’ rituals on Dussehra. “It is worse during festivals as no one from BMC comes to collect garbage. The common garbage bins overflow every now and then in the absence of regular cleaning,” Chetna Sawansukha, a resident of Old City area, said. “Mosquitoes and flies, attracted to such bins, create more chances of spreading diseases,” she said. Ankita Jain, a resident of Lalghati, had words of praise for the corporation’s door-to-door garbage collection initiative. “But, now it is not taking place on a regular basis,” she said, and demanded a special cleaning squad during festivals. Sources said that out of the five lakh households in Bhopal, the door-to-door initiative, for which more than 2,000 rag-pickers were engaged, is done only in about 2.5 lakh houses. This leaves a huge quantum of uncollected solid waste, especially during festivals. Bhopal mayor Alok Sharma told HT that he had inspected all the ghats where idols would be immersed. “We are trying our best to manage the city during festivals. It is true that the number of cleaning squads come down during Navratri and Dusshera. They (workers) visit their native villages to celebrate the festival and we cannot stop them,” he said, appealing to the people to cooperate with authorities. The sanitation policy and solid waste management of Bhopal raise concerns about how it will become a Smart City under the Centre’s ambitious plans. A detailed project report (DPR) on solid waste management for Bhopal and seven neighbouring towns has been set aside. Five years after identifying 60 acres in Adampur for developing a scientific landfill site, it is yet to be operational. Of the 27,000 complaints BMC received, over 19,000 were about garbage collection. A Swacch Map app, on which residents can upload pictures of garbage in the locality, has not yet taken off.